We were married in Las Vegas in August 2000 and during our first stay in Sin City we had seen all the hype and tacky souvenirs from Area 51. When we returned home from that trip I found your website and have always checked it from time to time for updates. So when we decided to go back to Las Vegas this August we both decided a day trip to Dreamland was a must. After a night on Fremont Street we got up and checked out of the Horseshoe hotel at around 11:00 AM, got into our rental car and found our way to Highway I-15. It was an amazing day out as we passed the Las Vegas Speedway and Nellis AFB, the Red Flag exercises where taking place but we did not see anything as we drove by the area. Using the map from your website, we followed exit 64 got onto US-93 north. The drive was nice with the odd lake on the driver's side and a desert on the passenger side. Having never been to this area before, we stopped for gas in Alamo, as well as some munchies, and then continued down the Highway. We came across the old casino and made our way onto Highway 375 (Extraterrestrial Highway). 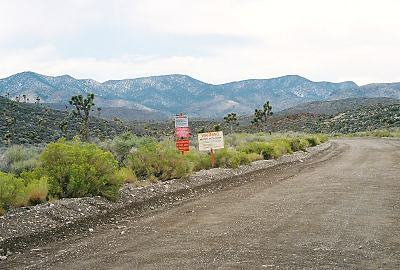 As stated in the directions, several cars where parked in the lot owned by the Area 51 staff. We stopped to take a few photos of the area, including the famous landmark, and then continued on our journey. We were both amazed to witness the landscape around us become more and more barren. We both joked that Willie Coyote and the Roadrunner would appear on the side of the road anytime soon. When we finally reached Hancock Summit, we both saw Groom Lake Road appear at the bottom of the hill. We were amazing on just how long the road to the base was and how flat the area is. When we reached the bottom the Valley opened to the beautiful desert landscape that we had we had only seen in photos, which gives it no real justice to being there. Still in awe of the surroundings we continued along Highway 375 and find the famous Black Mailbox (now white). In little time the landmark appeared on the left and we of course pulled off the Highway, snapped a few photos, and then made our way along Mailbox Road to the Area 51 Main Gate. We made our way along Mailbox road, stopping for a Coyote along the way - no Road runner though. As we approached the 5 way crossing at Crescent Reservoir we where met by two men in an older blue pick-up truck driving the other direction. They asked if we where lost, we told the two men of the quest of ours and they where nice enough to make sure we got on the right road to Groom Lake Road. "They will know you are coming" said the driver of the truck to us as we said thanks and continued on our way. We are assuming it was Mr. Medlin or workers from the ranch, they where very nice to us and again we say thanks again for the directions and assistance. Once on Groom Lake Road we both got quiet as we got closer to our goal. We passed groups of cows along the way, and then made our way up a hill. We knew the border was close when we saw an area to the right that had been made into a turn around. 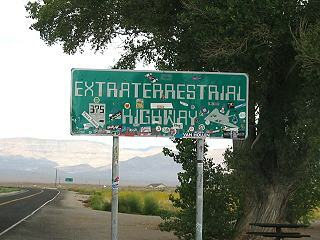 We drove around the corner and there it was the famous border of Area 51 with the signs on both sides. We stopped the car about ten feet from the line in the sand, looked out the window to see the Cammos on the nearby hill to the right and the security cameras on the hill to the left. My wife got out of the car, took some quick photos of the sites, including the Cammos watching us, and then she collected some sand and rock samples. She has a growing collection of samples from places around the world and now had a sample that would be the talk for some time with her fellow collectors. Then will our hearts beating a little faster then normal made our way back around the bend to which we came from. For some strange reason we felt safer around the corner, not to sure why really. We got out of the car and enjoyed the moment that had just experienced. We were about to head back down the road when we both saw two white trucks heading along Groom Lake Road toward us. Not sure who was in the trucks where we both froze in place as the two vehicles approached us. We are both relived and a little disappointed when they turn out to be part of an adventure tour from Las Vegas. We waved at the tourist as they made their way to the border and then drove off for lunch at the Little A'Le'Inn in the Town of Rachel. The woman running the diner made us some great tasting omelets as we checked out the UFO photos and alien items that decorated the place. There was four military personnel eating there as well and overheard them saying that the Red Flag exercises would be starting in about half an hour. We purchased a few items from the gift shop and then started to make our way back to Las Vegas. As we stepped outside we heard the roar of jets overhead. We could see four jets high in sky above us screaming along the open sky. Along Highway 375 just before the hill towards Hancock Summit, our car is rocked as a fighter jet does a fly by along the valley floor. The jet is so low we can see the engines blue and orange flame as it takes off high into the mountain range to the left. We stop at the top of the summit and watch six to eight jets flying around the sky, an amazing sight to see and hear. 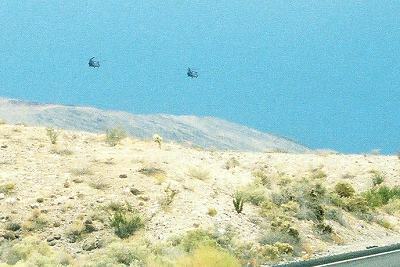 Along the long flat stretch of US-93 we also witnessed two transport helicopters flying towards the Las Vegas / Nellis AFB area. This just added to the whole experience of the trip. We saw even more military aircraft as we passed the Nellis AFB along Highway I-15 on our way into Las Vegas. Wish we could have stayed in the area longer to watch the Red Flag exercises but we had other plans to keep that night.